The essays brought together in this book understand phobia not as a pathology, but as a versatile moral, political, and aesthetic resource – and one with a history. They demonstrate that enquiry into strong feelings of aversion has enabled writers and film-makers to say and show things they could not otherwise have said or shown; and in this way to get profoundly and provocatively to grips with the modern condition. 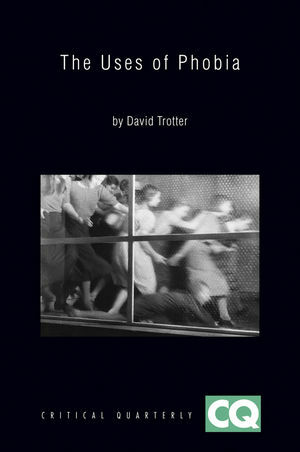 David Trotter is King Edward VII Professor of English Literature at the University of Cambridge. He was co-founder of the Cambridge Screen Media Group, and has published extensively on nineteenth- and twentieth-century British and American literature. Chapter 1. Household Clearances in Victorian Fiction. Chapter 2. The Invention of Agoraphobia. Chapter 3. Naturalism’s Phobic Picturesque. Chapter 6. British First World War Combat Fiction. Chapter 7. Ford against Joyce and Lewis. Chapter 9. Phoning It In. Chapter 10. Lynne Ramsay’s Ratcatcher.